Sigma Tau Delta is the International English Honor Society. A member of the Association of College Honor Societies, it was founded in 1924 at Dakota Wesley – an University. Exhibit high standards of academic excellence and serve society by fostering literacy. 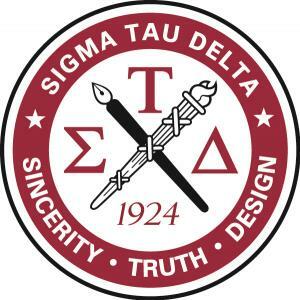 ​Sigma Tau Delta’s central purpose is to confer distinction upon students of the English language and literature in undergraduate, graduate, and professional studies.Sigma Tau Delta also recognizes the accomplishments of professional writers who have contributed to the fields of language and literature. Networking with other members and English department faculty and staff. Applications are available in the English Department. Dues are $40 and include a graduation cord, pin, certificate, and one year of newsletter and journal subscriptions. Unlike many other student organizations and honors societies, this is a one-time fee. Once you are a member, you are a member for life. Come to meetings and events! Get to know the officers and other members. Have an idea for an event? Let us know and we will discuss it. [Contact Information is Forthcoming].